You’d be forgiven for wondering why Quad parent company LAG felt the need to upgrade its small-form Vena amp to Mk II status: after all, the original – launched back in 2014 – was good enough to take top honours in our mini-amp Group Test in November of that year (HFC 390). despite being one of the pricier models in contention. It’s not hard to see why. The Vena was a fine mix of retro Quad styling and up-to-date facilities, echoing the company’s classic amps of the past while offering features such as Bluetooth wireless connectivity and a USB port to allow it to be connected straight to a computer. Above all it was rather good, our test back then noting that it “proves one of the most able performers in the group across all inputs because it doesn’t obviously sound like a compact audio product”. 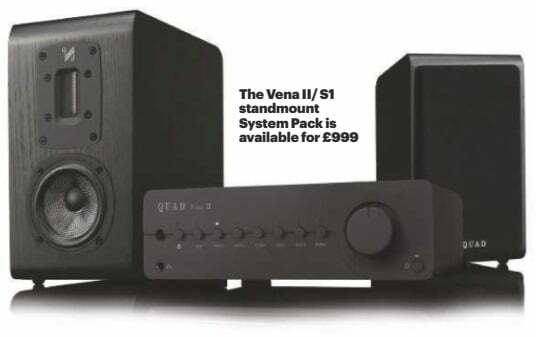 Yes, there were mentions of loose bass and rather two-dimensional stereo imaging, but it was acknowledged that by the standards of the competition the Vena still impressed and showed no signs of what was (by Quad terms, at least) a very modest price. Fast-forward half a decade, and we have the Vena II – and at first glance it’s hard to see exactly what has changed. The little amplifier still comes in Quad’s understated Lancaster Grey as standard, with optional (and substantial) wood sleeves in a choice of sapele mahogany veneer (pictured), or gloss black or white lacquer, adding a smidge to the minimal bulk. 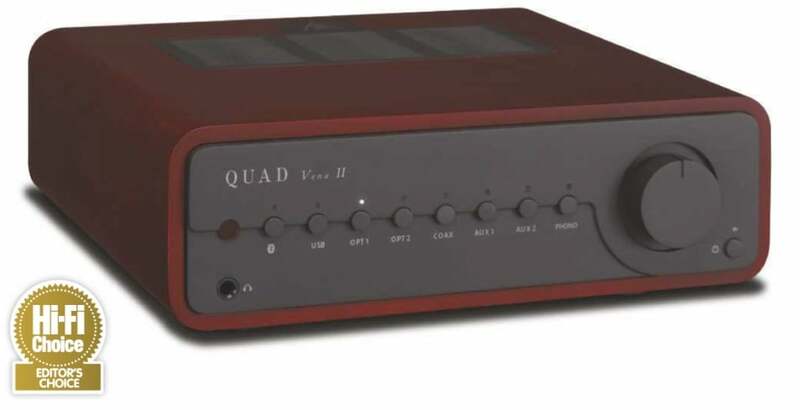 The controls, meanwhile, remain reminiscent of those on other classic Quad products of yore, such as the QII integrated and PA-One/VA-One (HFC 417): the Vena II may not have the valves of those offerings, but it’s unmistakably a Quad, and while some may feel the grey finish is a little dowdy, I think it gives the ‘basic’ version a more purposeful look that’s rather lacking from the slightly too retro wood-finished options. Inside the Vena II. however, the changes are more marked, with both the digital and analogue sections heavily revised: out has gone the Cirrus Logic DAC chip – which limited it to 24-bit/ 192kHz – to be replaced by the ES9018K2M DAC. Part of ESS Technology’s Sabre32 Reference family, it allows the Vena II to push its digital compatibility all the way up to 32-bit/384kHz and DSD256 when connected to a computer via USB. The other digital inputs – two optical and one coaxial – remain limited to 24-bit/192kHz. which will likely prove no limitation to most users. ESS’ own jitter elimination circuitry, and leaving it at that – IAG’s engineers have also paid close attention to the implementation of the conversion, including the design of the post-conversion active filtering. The work in the digital section has been echoed in the analogue areas of the Vena II and while the same Quad-designed Class AB amplification found in the original remains, it’s now powered by a new 200VA toroidal transformer with generous reservoir capacity downstream of it, designed to enhance both the amplifier’s grip and dynamic ability. Also new here is a low-noise JFET-based moving-magnet phono stage – acknowledging the increased interest in vinyl since the original Vena was launched – while the boom in headphone listening is also marked with enhancements in that area. The output was previously fed from the main amplifier circuit: now there’s a dedicated headphone amp using current-feedback circuitry for better dynamics and detail. Otherwise, the Vena II demonstrates the same good design practice that’s seen in the 2014 version, with volume controlled by a high-quality ALPS motorised potentiometer, and close attention paid to circuit layout and power supply provision. The specification is completed by Bluetooth supporting aptX and AAC, and two line-level inputs in addition to the phono in, while outputs run to a single pair of speaker binding posts, optical and coaxial digital, a set of pre outs should you want to add a power amp and a compact remote handset for the usual functions. Small it may be. but the Vena II is comprehensively equipped. The new version is comprehensively better than the amplifier that it replaces, which was itself no slacker. The bass is much tighter and better defined, offering decent extension, while the greater punch and dynamic ability is as much about detail and speed as all-out slam and the ability to play loud cleanly. If the original succeeded by not sounding anything like a small amplifier, the second- generation model takes that to a new level, making it an ideal hub for a stylish system even if you’re not limited for space. Quad offers a ‘serving suggestion’ for the Vena II, combining it with a pair of its compact S1 standmount loudspeakers (HFC 404) in black ash as a System Pack (pictured above), but based on the performance it puts in in my listening room this amplifier is more than good enough to be used with more ambitious speaker choices. For a while I run it into Neat’s excellent Iota Xplorer floorstander (HFC 435), having already heard it performing well with the same company’s tiny original Iota in ‘desktop audio’ mode. Tabletop audio is an application to which the Vena II’s dimensions make it very well suited, but despite its seemingly modest 45W per channel into 8ohm power output claim, it’s more than capable of delivering a big, room-filling sound, whether from vinyl, other analogue sources or a digital feed. The Flood from Talk Talk’s 1991 Laughing Stock album, the Vena II’s combination of persuasive clout and detail retrieval takes you right into the heart of the textures of the track to magical effect. The Quad Vena II Integrated Amplifier improves upon its predecessor, incorporating all new DAC circuitry, offering up to 32-bit audio playback, an added MM phono stage for turntable support and Bluetooth wireless connectivity to get the most out of this compact, stylish integrated amplifier. An obvious rival for the Vena II is NAD’s unique-looking D 3020 V2 (HFC 435). Like the Quad, it now has a moving-magnet phono stage input. Marantz has taken its classic amplifier style and minimised it to create the HD-AMP1, complete with ‘computer audio’ input and extended DSD capability. If you want to go truly tiny, Pro-Ject’s minute MaiA S2 is just over 200mm wide and stands 36mm tall, yet claims to deliver sufficient power – 25W per channel- to feed sensitive standmount speakers.